MRU stands for Most Recently Used files list. If you are handling a no. of projects and/or code files frequently, its easy for you to switch from one to another using the MRU list that Visual Studio maintains. You can access the recent files by navigating to Visual Studio menu: File | Recent Files. Similarly, you can access the recent projects and solution by navigating to the following Visual Studio menu: File | Recent Projects and Solutions. Now, from the left side navigation links, navigate to Environment | General. 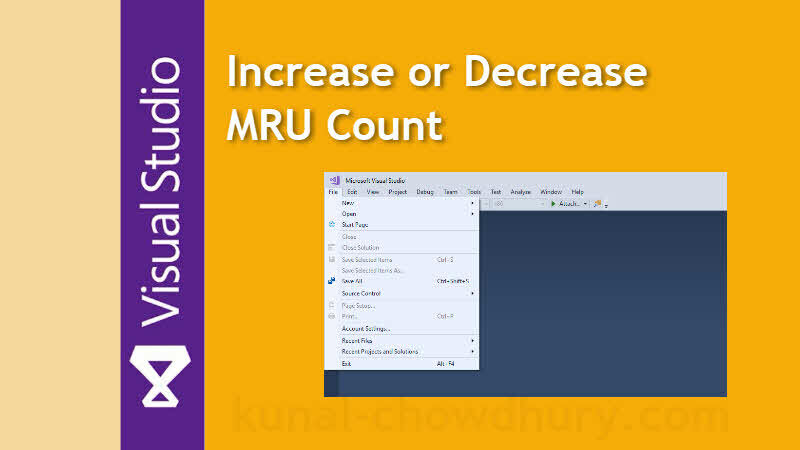 As shown below, if you would like to set (increase or decrease) the maximum count of most recently used files, change the Items to show in recently used files list input box. Please note that the most recently used list can contain 1 - 24 files only. If you have come this far, it means that you liked what you are reading (Do you know that you can increase the list of recent files and projects shown in the Visual Studio File menu? ).